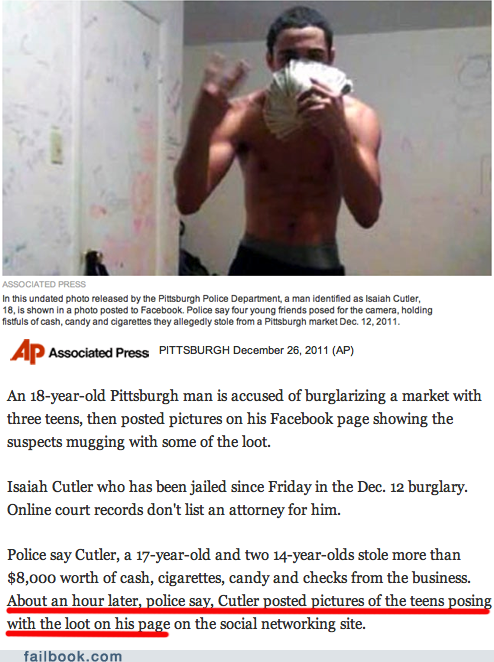 well, i suppose if you're going to fail at burglary, you might as well give the rest of us something to laugh at. wow, when failbook called this creepy, they weren't kidding. 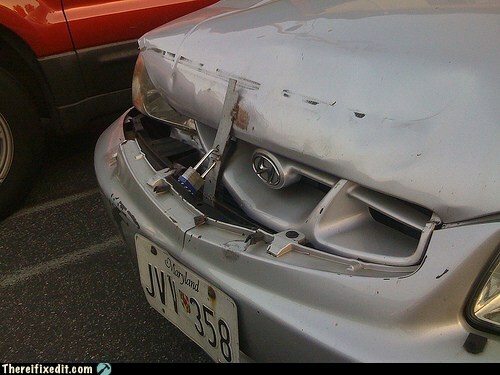 ugly though it may be, in the event that there really is someone going around stealing car parts, if the condition of this car doesn't deter them, this security measure actually would raise the bar of difficulty for such thieves. it seems like it could actually be an effective security strategy, if only the threat didn't seem so imaginary. 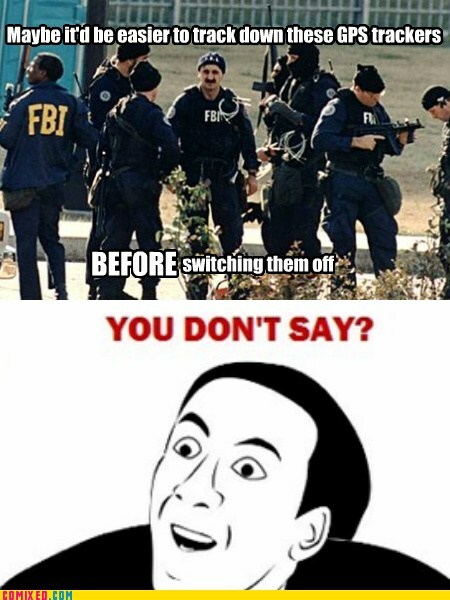 i couldn't help but laugh upon reading that the FBI had difficulty finding some of the 3000 GPS tracking devices they switched off in response to a recent court ruling. great to see that at least sometimes the police are not above the law. not so great to see an off-duty cop putting peoples lives in danger or not complying with the the officer trying to pull him over sooner, almost like he thought he could get away. you've got to wonder about a cop who thinks he can succeed by acting like a crook. 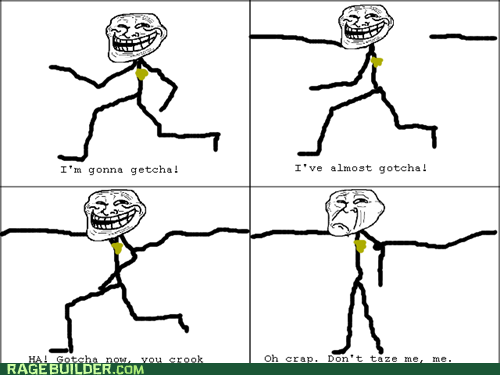 this isn't just in funny pictures online. 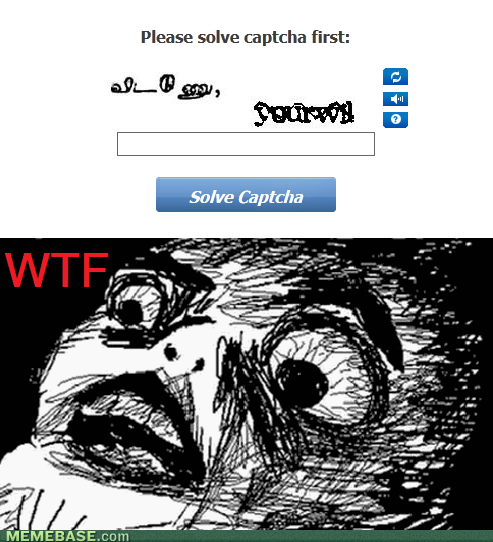 more and more i'm seeing CAPTCHA's that use characters that bare no resemblance to anything i can actually type with my keyboard, leading me to one inescapable conclusion - you need to use magic to solve these things; they're CAPTCHAs for wizards. 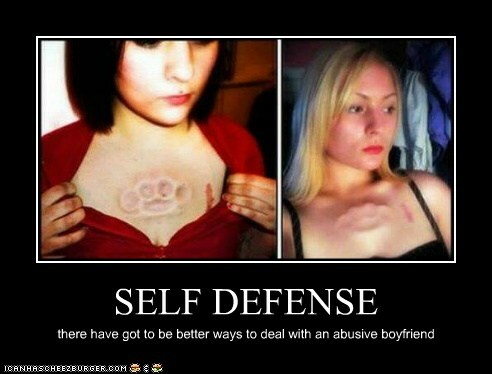 so, they're not actually for self defense, and apparently they're not even really brass knuckles (which is good because then it'd be against the law to carry them, possibly even this way), but i can't be the only one who looked at them and wondered "how can they use those now?" what do you think? 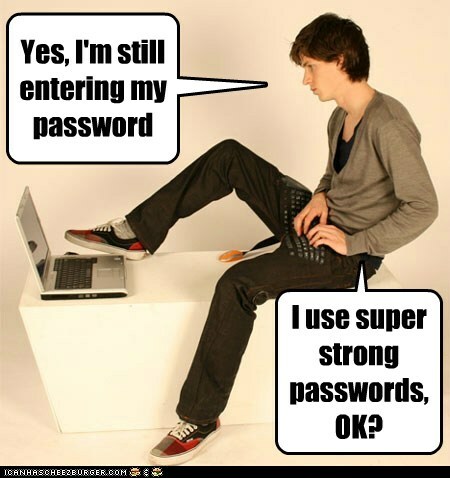 would pants like these promote passwords with more complexity, or would he simply be hitting the same small group of keys over and over again? 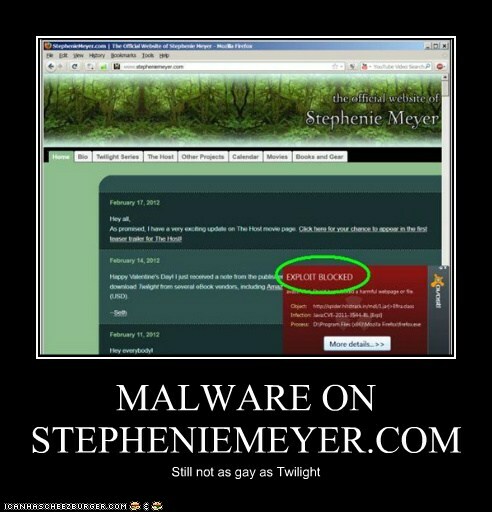 really, of all the places you could put malware, someone decided to put some there? haven't her fans suffered enough already? 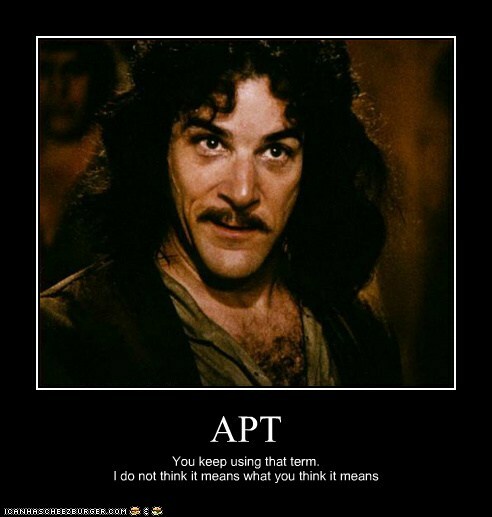 APT (advanced persistent threat) is abused and misused so much by security marketing departments (and people who aren't in marketing but are still doing marketing) that abusing the term has itself become a meme. it really needs an anti-body meme to counter it. 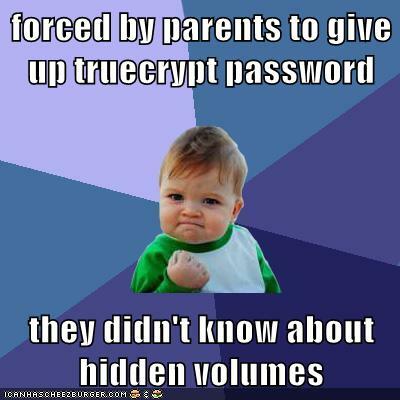 there's a term that gets bandied about in some security circles - cyber-douchery. the coining of this new and decidedly scaremongering sort of term really seems to qualify as cyber-douchery. that's not to say the topic of SCADA vulnerability to attack isn't real or isn't scary, it is, but cyber hiroshima? really? there's no need to evoke irrational responses from your audience. are you thinking what i'm thinking? 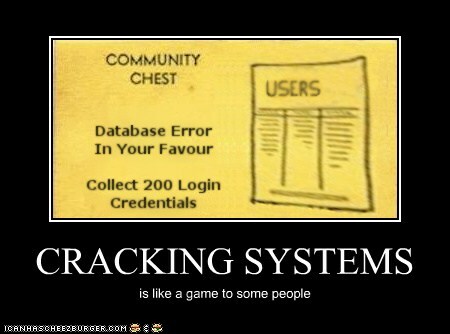 'cause i'm thinking someone should actually make this monopoly variant called crackopoly. no doubt some would prefer to call it hackopoly, but it appears that one's already been done (and with a much more appropriate definition of "hack" it seems). i can haz low profile page? sometimes i get the feeling that the concept of keeping a low profile (a necessity for a criminal) is more confusing to people now that we have facebook profiles. obviously there's no "low" setting on them, and even if there were, it would probably be talking about privacy where "low" would be the last thing a crook would want. 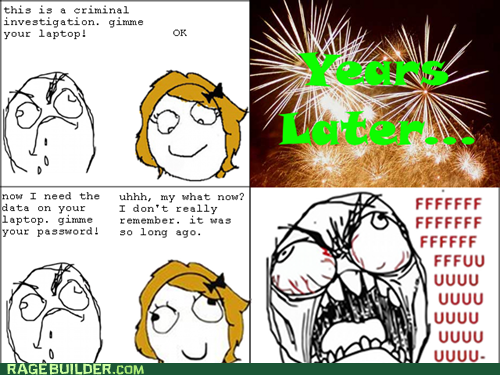 hurray for dumb criminals. just a little reminder that bad things can happen to good features. i've heard of cops tailing someone, but i never knew they could chase their own tail. 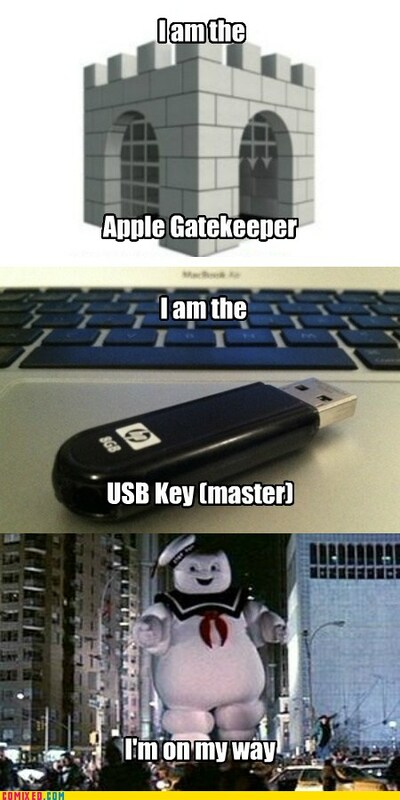 while it may not always be the case that gatekeeper + USB key = destruction, the fact that gatekeeper is wide open to USB and other removable media (not to mention LAN) is certainly inviting trouble. 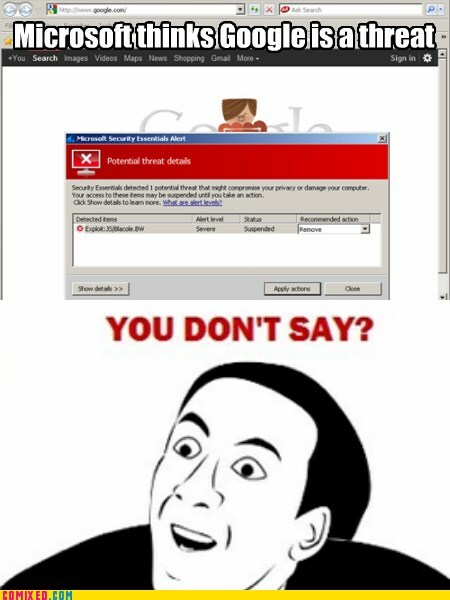 now, unless microsoft security essentials has begun adding detection for business threats, i think it's safe to assume the alert on google's main page is a false alarm. but you could almost believe this was on purpose, couldn't you? funny money? who's laughing now? 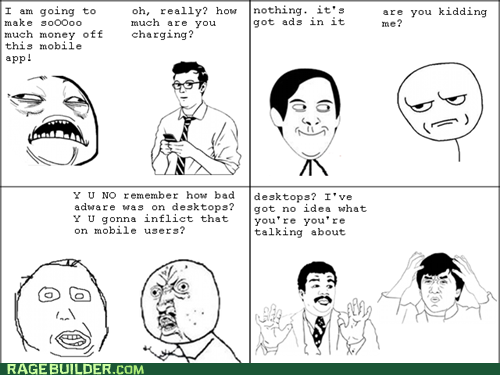 some things just shouldn't be discussed online. this is one of those things. if you think you can prevent laptop theft by attaching a little cable to the plastic housing, you might be a security idiot. 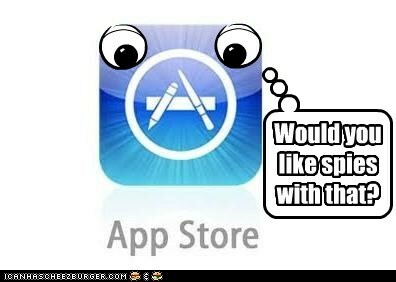 just another jab at apple for being so permissive about apps that steal personal info from users. 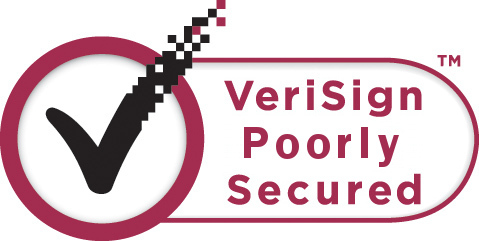 attention to detail is kind of important in security. you've got to be on the look out for things that are out of place, things that don't belong - like those letters don't belong in that order. 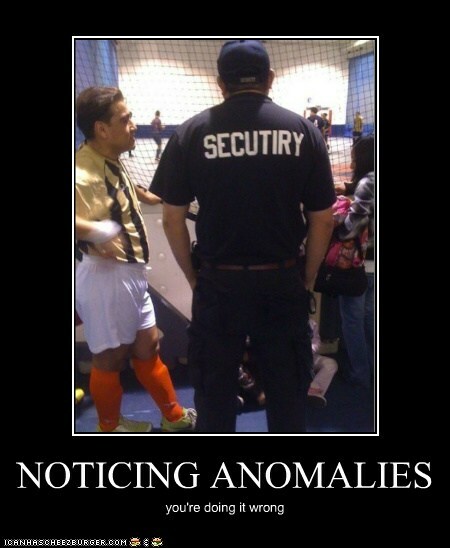 of course, the spelling isn't really important for security, but i suspect the score of that game isn't either. 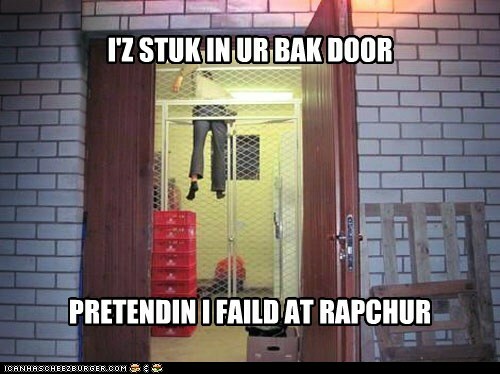 this is, of course, prank (and a pretty funny one at that). but it's a prank where the prankster is posing as something that's supposed to represent authority. the authorities don't take kindly to people impersonating them or anything connected to them - the opportunities to damage their credibility is too great. of course, in some countries, the authorities are quite proficient at damaging their own credibility. 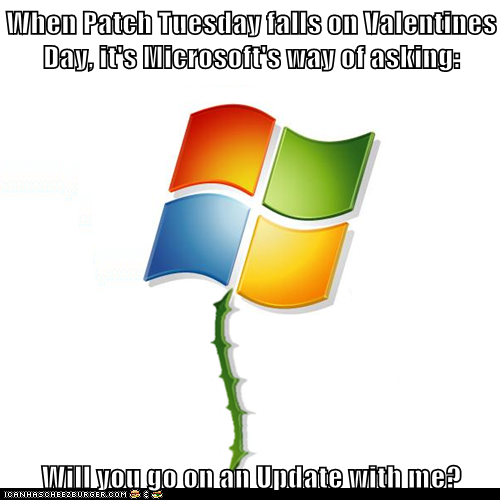 here's a special post to commemorate this unusual conjunction of valentines day and patch tuesday. not sure how often this happens, but i bet it's not often. 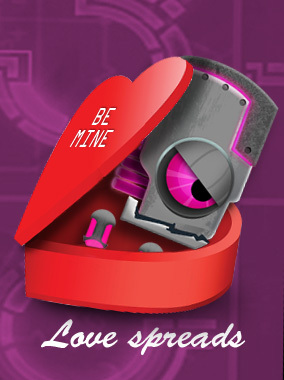 just another reminder to be careful about opening those online valentines. you never know what you'll find inside them. online valentines are usually all thorn and no flower. an unfortunate truth that the love lorn have discovered over and over again. you'd think people would have learned their lesson with the loveletter email worm, but hope springs eternal it seems. figuratively, shooting yourself in the foot means that you ruin your ambitions or career. presumably that came from a literal case where someone actually shot themselves in the foot and it ruined their plans - not unlike this fellow. if, in 2012, you're still trying to get at data on a laptop you confiscated back in 2010, your chances of success are not good. ramona fricosu, who was ordered by the court to decrypt the data on her laptop, could probably make a pretty compelling argument along these lines right now. if you expect a defendant to remember an encryption key years after you confiscate their data, you might be a security idiot. i can't really explain how this popped into my head, i can only show you that it did. this is, of course, a parody of the amazing horse song from the makers of weebl and bob, but this one talks about rogue security software aka fake antivirus aka scareware. y'know, by any reasonable, functional definition, downloading personal information without the user's knowledge or consent qualifies an app as spyware. i doubted path was the only company who did this, and in fact it turns out that many have, so it seems to me that there is in fact malware in the iOS app store right this minute. 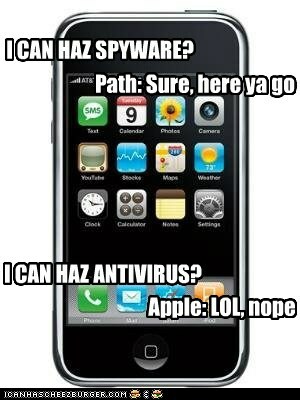 there's no anti-virus though, because apple won't allow it. all hail the security of the walled garden. if you wave people through security because they happen to have something resembling a badge then you might be a security idiot. whether or not things like android.counterclank qualify as malware or not (do the intricacies of malicious intent really matter when the unanimous consensus among users is that it's unwanted?) is of secondary importance to me. what really boggles my mind is that mobile app developers are actually falling for this con when desktop adware is still so fresh in people's minds (well, my mind, at any rate). 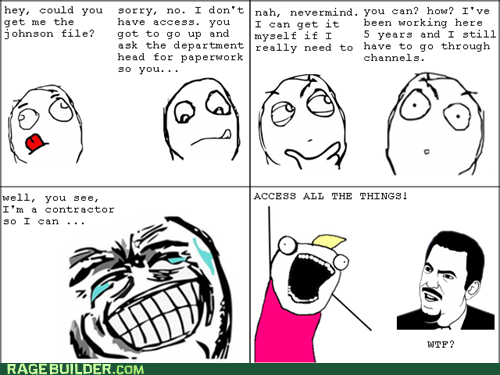 i have it on good authority that some employers actually do give contractors more access than their own employees. pretty ridiculous if you ask me. if you give outside contractors more access than you give your own employees, then you might be a security idiot. 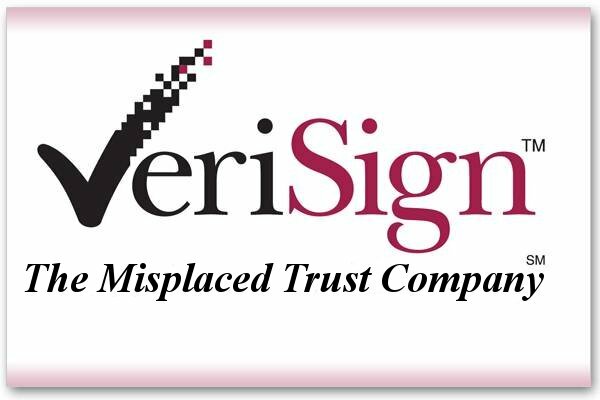 so apparently verisign was breached back in 2010 and has yet to satisfactorily explain the details of what happened. 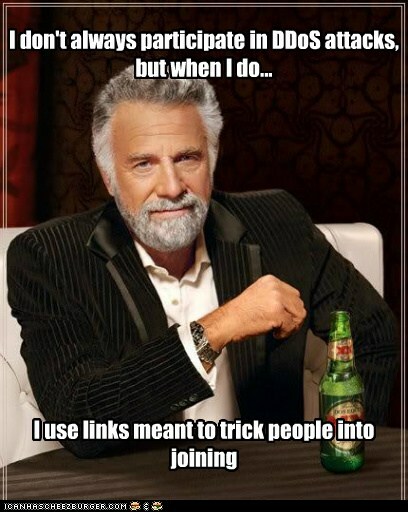 not a good way to behave when much of the security of the web depends on you being trustworthy. so apparently someone in anonymous finally figured out how to provide their DDoS minions with plausible deniability, even if they can't provide them with actual anonymity. low orbit ion cannon has been made into a web-based version that people can be tricked into visiting and launching attacks from their browser. 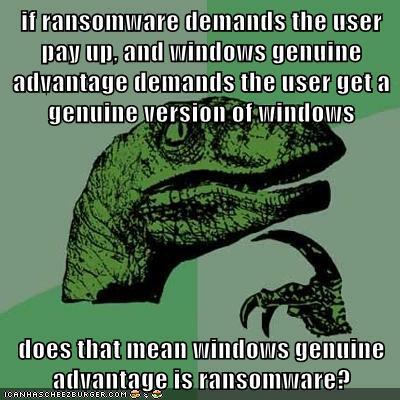 sometimes the line between malware and legitimate software isn't as clear-cut as we'd like (such as opt-in adware, or spyware to monitor prison inmates) so i started to wonder (genuinely) whether windows genuine advantage could qualify as a kind of ransomware. after all, it does demand that you (if you have a pirated copy of windows) pay microsoft for a legal copy of their software and prevents certain functions until you do. 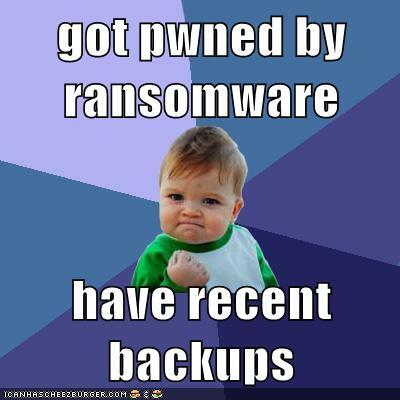 apparently ransomware (malicious software that demands a ransom in order to regain access to your computer or prevent notification of authorities to supposed illegal activity) is on the rise. we'll see if backup media will follow suit.